South Korean casino operator Kangwon Land Inc said its net profit for the three months to June 30 fell by 14.4 percent from the prior-year period. Such profit was nearly KRW94.6 billion (US$84.1 million) compared to KRW110.4 billion in the second quarter of 2017, the company said in a Thursday filing to the Korea Exchange. 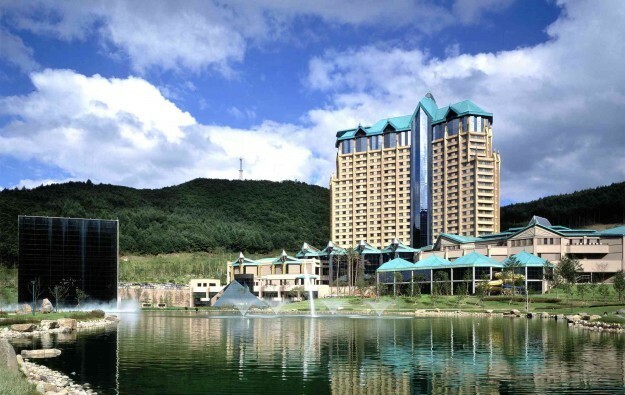 The firm runs the Kangwon Land casino resort (pictured), the only of South Korea’s casino schemes that is permitted to cater to local players. The property is located in a remote upland area of Kangwon province, 150 kilometres (93 miles) from the capital Seoul. Revenue from sales in the April to June period totalled KRW338.7 billion, down 9.2 percent on the KRW372.9 billion achieved in the prior-year quarter. Quarterly operating income at the firm declined by 15.1 percent year-on-year, to approximately KRW115.0 billion. Kangwon Land reported gaming sales of KRW311.3 billion for the three months ended June 30, a decline of 9.1 percent from a year earlier. The company reported declines in all of its gaming segments, with sales in the mass segment falling 9.4 percent year-on-year, to KRW151.6 billion. Revenue from sales in the firm’s so-called “Membership Club” stood at KRW54.4 billion, down 18.1 percent from the prior-year period. Non-gaming revenue fell by 9.5 percent year-on-year to KRW27.4 billion in the second quarter, the firm said in a separate presentation published on Thursday. “Kangwon reported an earnings miss (-5 percent versus consensus) with poor details, though it was not a complete surprise,” said brokerage JP Morgan Securities (Asia Pacific) Ltd. “On the bright(er) side, we think the trend is unlikely to get much worse from here,” wrote analysts DS Kim and Sean Zhuang in a Thursday note. “The poor results reflect regulatory headwinds, such as the revenue cap [policy], reduction in tables count and operating hours, tighter VIP membership criteria, and shortage of dealers (Kangwon had to lay off 200+ staff amid HR scandal),” said the JP Morgan team. That was understood to be a reference to a decision by South Korea’s president to order the sacking of 226 employees of Kangwon Land following a probe that suggested that they had got their jobs via unfair means, as reported by Yonhap news agency in March. Kangwon Land has slimmed its daily opening hours since April 1, following an order of the South Korean government. The casino at the property now opens to the public from 10am to 4am of the following day. The casino at Kangwon Land previously operated from 10am to 6am of the following day. For the six months to June 30, the firm recorded an accumulated profit of approximately KRW185.0 billion, down 23.0 percent from a year earlier. Revenue from sales in the first half of 2018 stood at KRW717.1 billion, a decline of 8.3 percent from the comparable period in 2017.